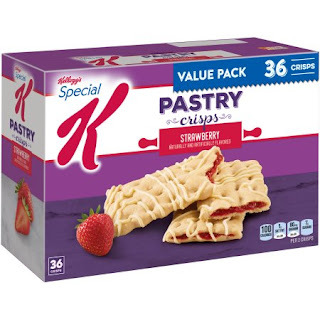 Special K recently introduced a new, "Bakery inspired," item that is just plain delicious. Called a, "Pastry Crisp," you can buy it in the flavors of strawberry, blueberry, or my favorite, brown sugar and cinnamon. There also is apparently a, "Cookies and Cream," as well as a ,"Red Velvet," flavor but I've been unable to find those, so I'll pretend they don't count. They taste kind of like a pop tart had a baby with a toaster strudel, but you don't actually toast them, they just already are crisp and fresh out of the package. 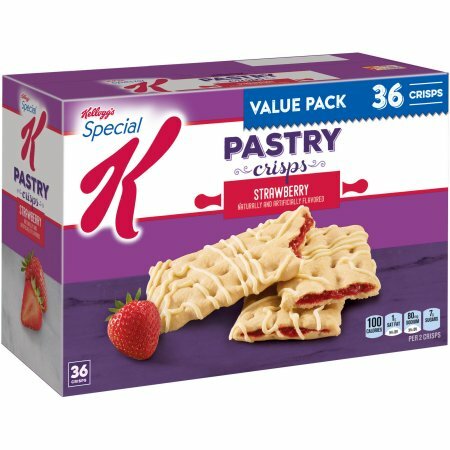 I'm not sure how Special K managed to make this new product as tasty as they did, but I and my wife love it! You don't have to wait for them to toast-up or worry about burning your mouth, you just pop open the package and then eat the two delicious Pastry Crisps contained within one wrapper--and then if you're still hankering, you have another! Pasty Crisps are my new favorite breakfast snack, although I do eat them at other times of the day as well! I encourage you to find these at your local store and give them a try as well, they're tasty. Note: Special K in no way asked me write this or even contacted me--they don't even know I exist, most likley. I just felt like sharing my love for Pastry Crisps and will of course email them to let them know I wrote this. Mike Wolfer is Running a Cool New Kickstarter! Yeah, "Kanye West Let Us Down," Myself Included. The Toyman Show Continues to Delight! Free Comic Book Day 2018 Was a Blast!